After a year on board the ship and in Africa, I finally made it home for a long needed break!! On arriving back in the UK around midnight we had the pleasure of sleeping on Heathrow airport floor, until we could catch a train in the morning to spend the day in London eating! Our first stop, after a day of airplane food (on one flight just gave us an apple and an orange as they had fogotten our ordered vegan meals! 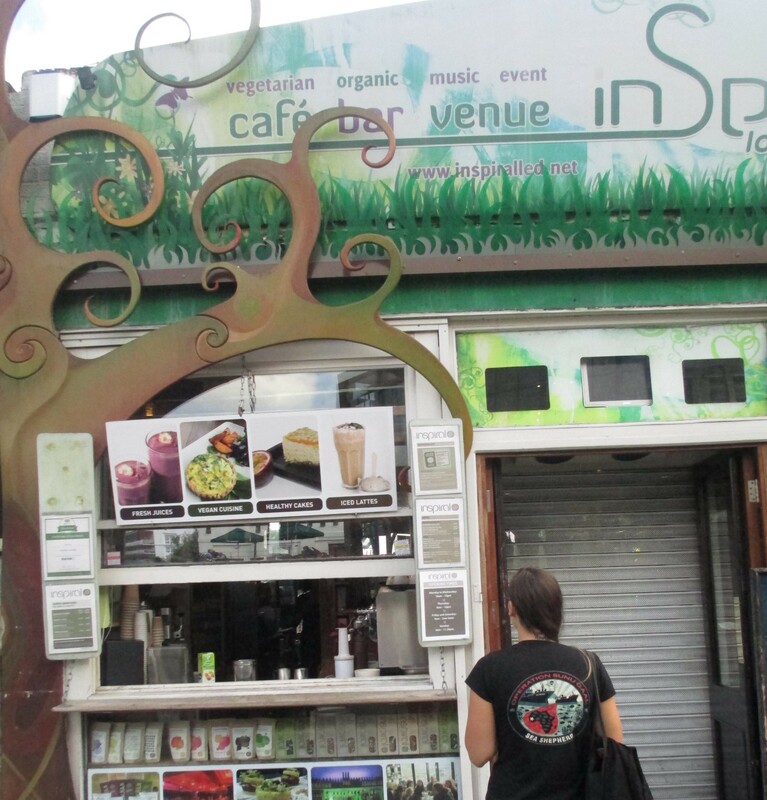 ), and a night of little or no sleep at all, we headed to Camden to the InSpiral Lounge. We heard that they did an awesome vegan breakfast, and we were not disappointed…. 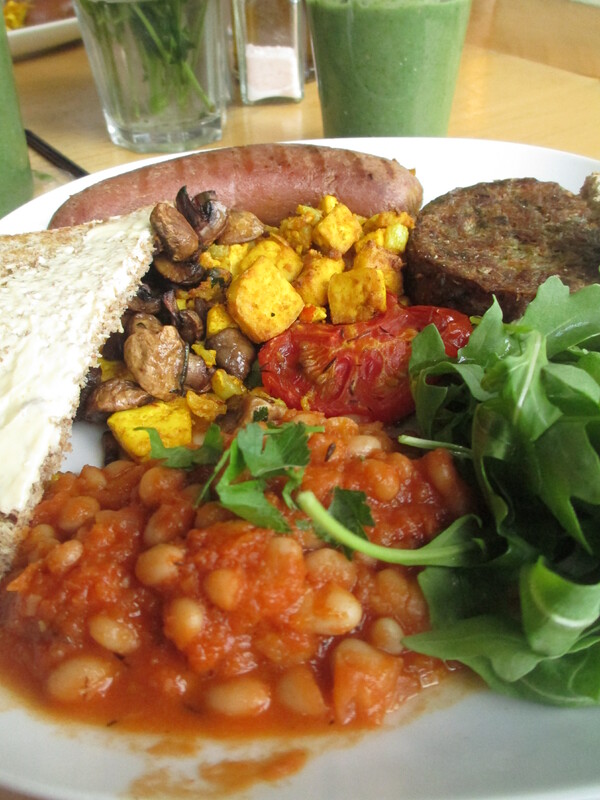 The breakfast came with homemade baked beans, rocket salad, rye or wheat toast, scrambled tofu, mushrooms, grilled tomato, a delicious vegan sausage, and the best part for me… a potato and onion hash which was just amazing. I really don’t know what they did to those potatoes! The InSpiral Lounge is right on the Camden Locks so you have a lovely view, and £8 ish for a huge vegan breakfast isn’t too bad, especially considering the location. It was the perfect start to our day of fun after such a crappy night. 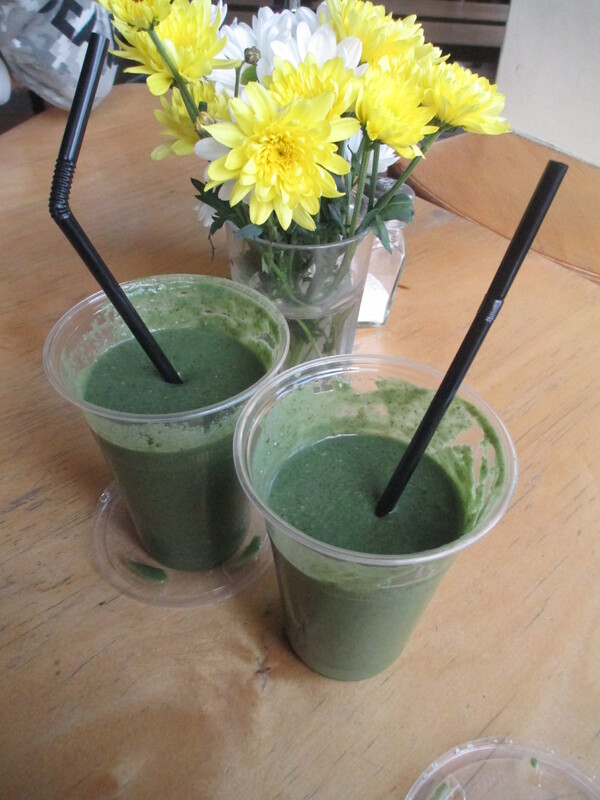 We also had a couple of their green smoothies which I would recommend to anyone! Overall this seemed an awesome place and I will definately go back if I’m ever in London again! Thank you InSpiral Lounge for pretty much saving us that morning! Before we catch the train home from Kings Cross, we popped round the corner to Vegan Cross. When I started researching vegan pastries and trying to find recipes that worked, this place came up with selling a full range of fresh vegan cakes, eclairs and pastries and I have wanted to come and try some myself for months now. 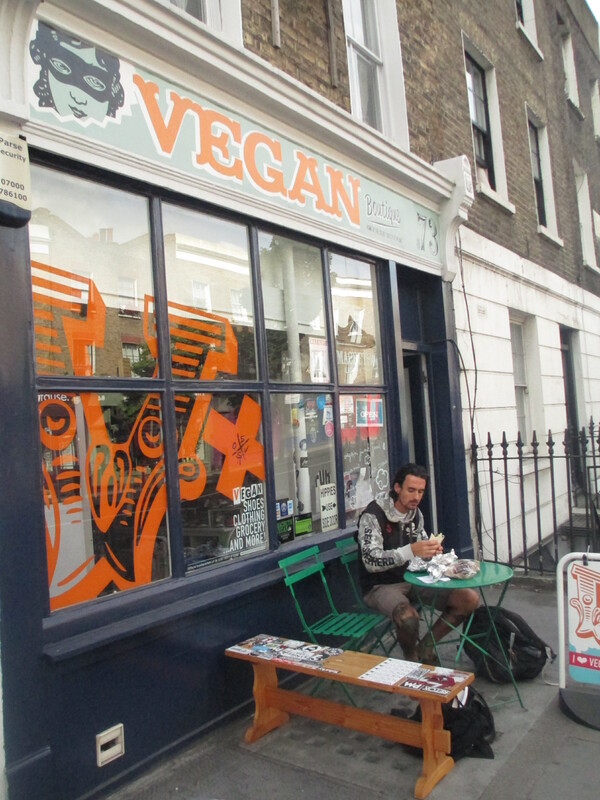 As well as this, VX is just awesome little shop where you can get vegan apparel, books, posters, a few groceries, as well as take away vegan junk food! 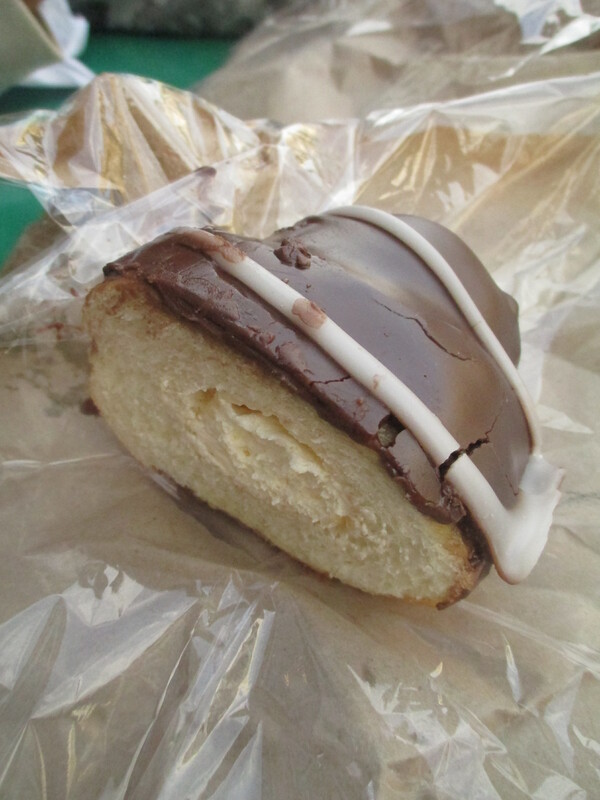 So we picked up a chocolate cream filled bun and a Wheaty donner kebab wrap. 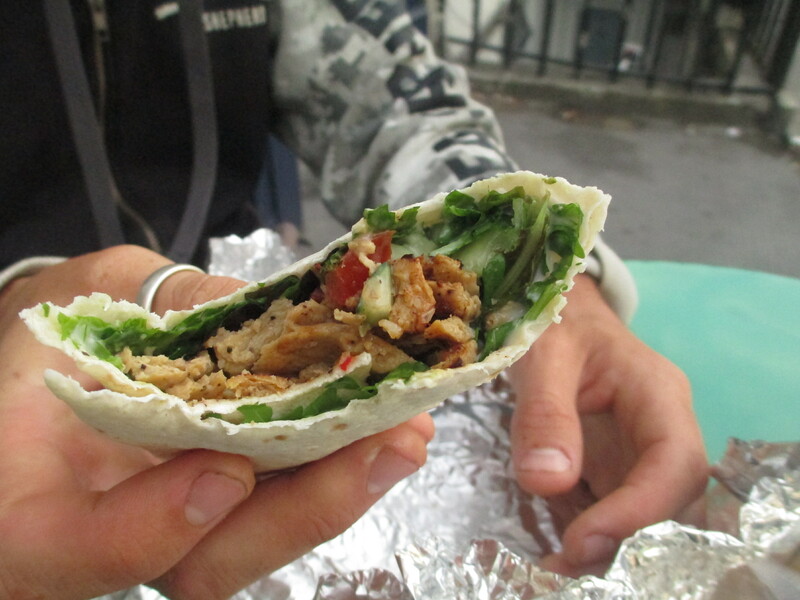 The Kebab was simple, quick and tasty which was just what we needed. But I was pretty disappointed with the cream bun. The cream was lovely but the bread, instead of being light and fluffy was tough, hard and very heavy. I had been so excited for so long to try this that it really was a let down. On the positive side, at least the options are there, which you can’t say the same for where I live in UK, where alot of restaurants shockingly still don’t have a clue what to serve you if you ask for a vegan option! I can’t wait to head back to London to explore some more vegan restaurants, it’s pretty excting to be home with a crew to feed everyday, hopefully I can get posting more regularly with some better, fresher ingredients. PS. I’ve gone all dot com and lost the .wordpress off of my blog address today! Pretty exciting part of my day.